Before leaving home I had sussed out on the internet that there was a high speed ferry, the Dodecanese Pride, between Kalymnos a couple of times a week including Fridays, leaving Kalymnos 15.30 and arriving Symi 17.45. Perfect timing for me. 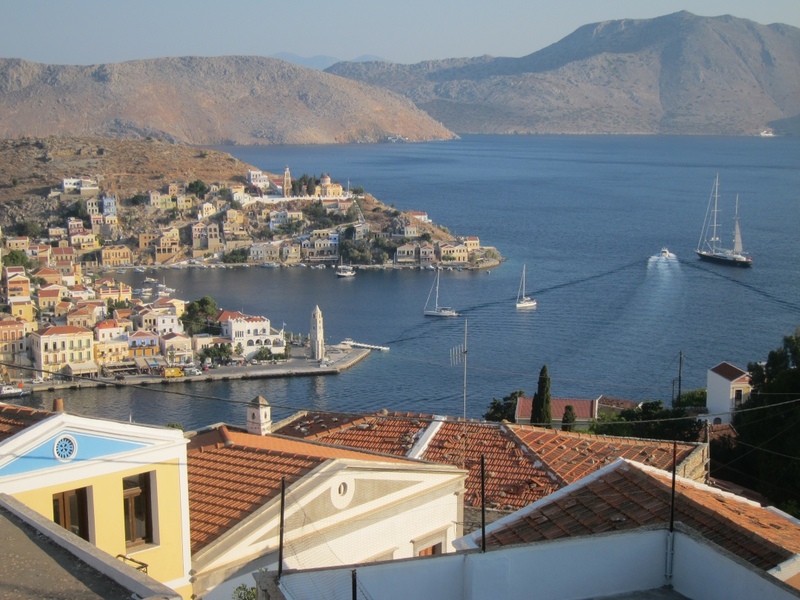 It meant that I could catch the 10.00 bus from Emborios to the main harbour, have a leisurely midday snack, and arrive on Symi in the relative cool of the early evening for the walk up to the hotel in Horio, the old town overlooking the harbour. I finished packing, had breakfast, settled my extremely generously priced bill, said goodbyes and waited at the end of the jetty for the bus. It was very late. Not a problem as I had plenty of time. When it came it wasn’t the usual low-floor bus with large double doors in the centre and space for putting Big Bags, it was a small coach with fewer seats and less generous milling space. It was certainly a sardine-tin of a journey but we got to the town and the bus disgorged its load of sweaty, irritable humanity onto the harbour-side. Personally I wasn’t irritable but the pulse was beginning to quicken. First port of call (note the maritime metaphor) was the travel agent’s to buy a ticket for the ferry. Once again I was let down by my ability to deliver a prepared request in reasonably fluent Greek and not being able to understand a word of the reply because it is assumed that I can understand normal-speed Greek which is delivered at a Formua 1 pace rather than jalopy speed. It was repeated for me, a little testily, but then I had to ask for it in English. I suspect that the reason I couldn’t understand any of it was that the reply did not contain any of the expected responses: “that will be €30”, “can I have your name?”, “do you want a single or a return?”, “it leaves at three thirty”. Instead I was being told that no, I couldn’t have a ticket because the ferry was full. End of story. However he did offer the grudging information that if I went to the ticket office on the harbour half an hour before the ferry sailed then maybe, just, maybe, they may have a spare ticket. It may be remembered that I had booked 4 nights in the Olympic Hotel under the mistaken impression that 2 September was Tuesday of next week and that I had to go there to cancel the reservation. The story was now even more complicated. The alternatives for travelling to Symi were a Big Ferry (the kind with escalators which vicariously attack your shins) at 05.00 the following morning and taking 6 hours to get to Symi via half the other islands in the Dodecanese, or a high speed catamaran on Monday. So, if I couldn’t get a ticket I would need a room for the night. Or part of a night. Very messy, very unsatisfactory. I didn’t simplify my life by retiring from work and going away from home to escape the myriad jobs which need doing in house and garden for this!!! Frankly, the guy in the hotel could not have been more helpful. The fact that I was cancelling the reservation was “no problem”. The Greeks have a way of saying that with a droop to the corners of the mouth and moving the hands gently apart in front of them palm-down in a very chilled manner clearly implying that it really is ‘no problem’. Not only that but he telephoned another travel agent and after a few minutes said that there were seats on the ferry and I should go to book them straight away. I left my Big Bag and shot off 150metres along the quayside. But when I got there it was the same story. This was the main office for that ferry company and it seemed that in the time it took me to walk 150 metres the last seats had indeed now all gone. But maybe, just maybe, they may have a spare ticket at the harbourside half an hour before sailing. By now my pulse was really going a bit. I calmed down by sitting in the lounge window of the hotel, drinking a frappé and doing stuff on the computer. I could once again access and reply to e-mails and I moved bits of money between bank accounts just because I could. When you are on your own it is amazing how disconnected you feel if you can’t use the internet to be in touch with people and how reassuring it is when you can. I thanked the guy in the hotel for his help in the accepted Greek way of indicating sincerity, by touching your chest with the flat of your hand or the side of your fist, and then left in time to make sure I was first in the queue for a ticket. It’s quite an expanse of harbourside in Kalymnos and took me a little while to track down the relevant ticket office but when I did I was pleased to see that I was first there, an hour ahead of sailing. I waited leaning on the ‘L’ shaped counter looking out of the window about 3 feet away. After 20 minutes a woman came and leant on the counter next to me, then a trickle and then a torrent of people all wanting tickets on the ferry-which-was-full. But I was at the front!. What a joke that was!!!!!! Eventually two young girls came to person the desk. After booting up the computer, which seemed to take an age because I was by now a bit pent up and wanting to get this sorted, one of them asked the woman 2nd in the queue for her name and where she wanted to go. To be fair the woman was very polite and said (in Greek) “this gentleman was first” but, no, her name was taken first and written under a heading of her destination ‘Ροδος’ – Rhodes. Then my name and destination, again written under a heading but half way down the page. My name had to be carefully spelled out – remember this is a name in a completely different alphabet and they have no letter ‘H’, or rather they have a letter which looks the same but is pronounced ‘ee’. In the end we got there ‘Hankei” … well, what’s in a ‘y’, I was on the list. Then the two young girls behind the desk left and were replaced by an older woman. Clearly more gravitas was needed for this situation. Third people in the ‘queue’, by now it was, to use a rugby metaphor, a pushing, shoving rolling-maul , spilling round the side of the desk as if trying to encircle the woman with the computer who clearly had the ball, were a Scandinavian couple whose names were so complicated that they had to be written by down by them in a tiny space left at the bottom of the page under the heading ‘Κω’ – Kos. Then others were shouting their names out, all heading for Rhodes and all Greeks with the result that the woman was familiar with the spelling and just scribbled away furiously. The top of the page under the heading ‘Rhodes’ went into a second column!! And we all wanted tickets for a ferry which was already deemed ‘full’. Believe me, I have simplified what was going on. There were far more complications than that. One woman had booked a ticket for herself by phone but forgotten to say she was accompanied by her children. Others were buying tickets to put packages and parcels on the boat. Others wanted tickets for freight and themselves. One guy came around the blind side of the rolling–maul on the outside of the building, opened the window next to the desk, and started bellowing his name and requirements in the poor woman’s ear. The ‘system’, I’m sure there must have been a system, was that the woman had to phone Head Office at a prescribed time to find out if any more tickets could be issued. She phoned several times with no result, each time having to shout ‘περιμένετε’ – ‘you’ll have to wait’, to the Greeks baying for tickets. Eventually she was given the all clear and suddenly started typing all the Greek names under ‘Ροδος’ into a spreadsheet, pressed a button and the printer started spewing out tickets which changed hands for cash at high speed. Then it seemed she had to get another clearance from Head Office for the three people going to Kos. And still I’m standing there, having been first in the queue by 20 minutes. Then she got the clearance for Symi and I got my ticket. Seems it works on the obverse of redundancy system here: First-in, last out. But I didn’t care, I had a ticket. No-one could have been more pleased if they had walked out clutching a ticket to watch Wales play England for the Grand Slam at the Millennium Stadium with only 5 minutes to kick-off. Now I’m on Symi and chilling out. And just look at the view from my hotel balcony! Must be one of the best views in Europe.